In all spiritual traditions, giving is considered an essential spiritual practice. from our own wealth or earnings is called dakshina. of the Guru's grace and teachings in our lives. to make these teachings widely available. and gifts to us as we practice it. and nurtures their capacity to give in all aspects of their lives. we find our own experience of gratitude is magnified. to receive and assimilate the grace flowing from the Guru. We offer dakshina out of love, to that which we love. 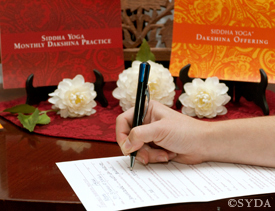 Through the practice of dakshina, we consciously acknowledge and strengthen our commitment to our spiritual path. through the Sidda Yoga Monthly Dakshina Practice. (Swami) MUKTANANDA, (Swami) CHIDVILASANANDA, GURUMAYI, and SIDDHA YOGA are registered trademarks of SYDA Foundation ® and are used here under license by the Siddha Yoga Meditation Center in Monterey.